The pin shown below, Elegant Sparkles, is really easy to make, especially if you start with a pre-formed pin with drop loops. It’s certainly possible to fabricate your own pin, or to twist one up with sterling silver wire, but if time is limied and you’d like to make some fast a easy gifts for the holidays, starting with a pre-made pin form is NOT cheating. Really. It isn’t. I got my pin form from Rings & Things. 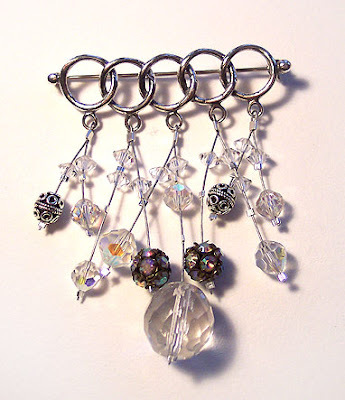 Besides that, I used a couple of Bali silver beads, vintage rhinestone ball beads, and several different sizes of vintage crystals with an aurora borealis finish. You will also need silver-colored beading wire, size #1 and #2 silver crimps, and a couple of tools: wire cutters, flat nose pliers, and a ruler. That’s about it! 1. Cut 2 pieces of wire to 2 inches long each. Cut 2 pieces to 3 inches long each. Cut 1 piece to 4 inches long. 2. Attach each piece of wire to a drop loop using a #2 crimp. Fold the wire in half (or into unequal “halves” if you prefer), feed it through the loop, and insert both ends down through the crimp. Flatten the crimp. Use the longest piece in the middle and the shortest pieces on the ends. 3. Divide up your beads and place a #1 crimp beneath each bead to anchor it in place. Add two or three beads to each wire, depending upon the length of the wire and the size of the beads.